Urijah Faber took the WEC by storm over four years ago, so it was only fitting he leave the organization with a bang – or in this case, a 1stRound submission victory over a I-would-rather-go-to-sleep-than-tap Takeya Mizugaki. 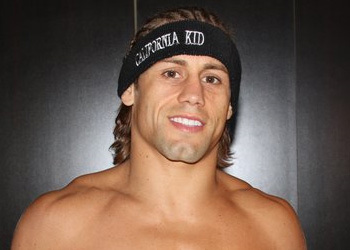 Faber has bumped 2Pac’s California Love as his entrance song for all of his blue-caged career. The single version of the track runs 4 minutes and 45 seconds. It took “The California Kid” five seconds longer to dispose of the Mizugaki with a rear-naked choke Thursday night at WEC 52. “The Japanese, they have that fighting spirit. This guy is known for being a guy that goes to the very end. So I knew I had to do something drastic and put him out, so I did,” Faber said of his opponent’s unconscious state. As long as Jose Aldo intends to stay in the UFC’s featherweight division, he will remain its king. So no way Jose (is that joke old yet?) will Faber look to have THIS happen to his thigh again anytime soon. With that said, the future Hall of Famer appeared to throw another verbal jab at reigning bantamweight king Dominick Cruz in his post-fight interview. Faber, as well as many others, have expressed their displeasure in Cruz’s elusive – yet highly effective – fighting style. Five of the champ’s last six wins have come via decision. After an unprecedented featherweight title run, it appears Faber has found himself a new home. It also helps that he can’t stand him some Dominick Cruz. “When I first started fighting, there was no 135-pound class, so it’s not like I had a choice,” Faber said. “I’m at my most competitive weight now. WEC 52 took place inside The Pearl inside The Palms in Las Vegas, Nevada.